Observing the World Heart Day every year is not a customary thing. Every ceremonial day has got its own meaning and implications to be carried on to all the human beings in this world. The main theme of World Heart Day is "One World, One Home and One Heart". 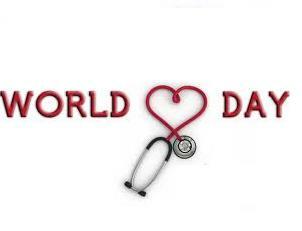 The World Heart Day is celebrated on 29 September every year. The main motto of World Heart Day is keeping a healthy Heart, preventing Heart diseases and proper treatment for Heart ailments. Awareness is being created among all individuals about the occurrence of "ischemic heart disease or IHD". Mostly all types of Cardio Vascular diseases can be named as Life Style diseases because the redundant / sedentary life style of individuals is the prime reason for such diseases. Therefore, there is a 100% chance that Cardio Vascular disease like Heart Attack can be prevented if proper caution is exercised about the life style. Every individual should have more physical activity as part of his daily life schedule. Few examples are – taking the stairs to reach next floor, Cycling, walking etc. At any cost consumption of liquor in all forms should be avoided as it causes severe damage to our body especially the Heart. Likewise, tobacco in all forms should be strictly avoided. Get rid of Smoking, chewing tobacco etc. immediately. Passive smoking should also be avoided, as scientific results have proved beyond doubt that it also causes many fatal diseases like Heart ailments, Cancer etc. It is always better to avoid excess salt in all forms as it helps to maintain a normal blood pressure. Take care to strictly avoid junk food especially from your childhood. Efforts should always be on to maintain an appropriate body weight in resonance with your height. This step will avoid you becoming Obese, thus avoiding chances of Heart ailments. Methods like meditation, Yoga etc. can be used to defuse your stress, tension in the mind, thus keeping a healthy working Heart. If possible, you can undertake to do aerobic exercises at least for ½ hour per day, it keeps your Heart in a healthy running condition. Take care to avoid items largely having saturated fats and trans-fats. Always try to have a balanced healthy diet at regular interval. Such diet should necessarily contain serving of fruits and vegetables at large quantities. Always try to live a mentally stress less life appreciating the things around you and have a light mind without any strain. Always try to live with a positive attitude about life and have a balanced approach between all spheres of life like Work, Family and Friends etc. Conclusion: Living a life without any Heart ailments is the prime motive behind celebrating the World Heart Day. Maintaining a healthy Heart in your life is pretty much simpler, that is you should always be good at heart. Be Good at Heart and live with healthy Heart. Spread this awareness message on World Heart Day to all your friends and relatives. Long live you and your Heart!